Like most families, we have a bunch of Christmas traditions. I love each and every one of them. Because they make us slow down enough amidst the hustle and bustle to feel the Christmas air thicken around us. Probably my favorite is reading a Christmas story under the Christmas tree each night in the glow of the twinkling Christmas lights. And if we're lucky, we sing a Christmas song too. I must admit this one gets tougher and tougher as my kids get older since sports start to linger into the evenings and the bigger kids are hit with homework galore. But it makes the nights that we do it that much better. Even when they are silly stories like "Frosty the Snowman." We read "The Gift of the Magi" the other night. I love it more every year. Each time we do an act of service we add a little straw to the manger. The idea is for our service to help make it soft for Baby Jesus by Christmas Eve. Love the straw in the manager idea!! PLEASE tell me about the Christmas Calendar sitting on your counter!! Love it! I shared one of my favorite traditions on my blog...about the 3rd post down. It's the Polar Express Minivan! I personally think the straw idea is the best I've heard!! P.S. Your blog is one of my favorites!! 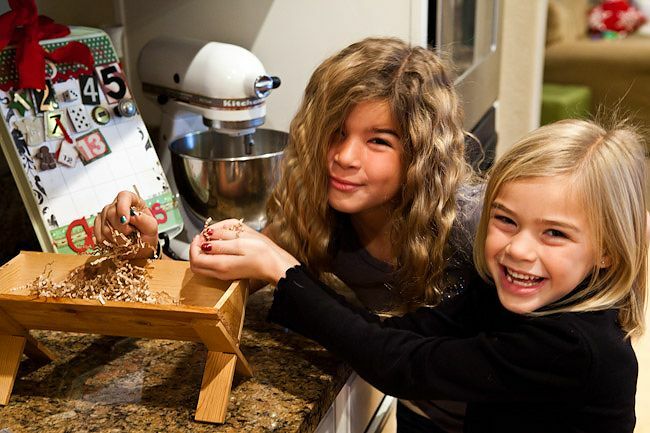 We did the straw in the manger tradition growing up and it had the cutest story to go with it. I've been wanting to get a manger for my family. Where did you find yours? I've also been looking for a manger. Where did you get yours? Grandma and I are here together enjoying remembering those "straws in the manger"! We love to go to Organ Stop Pizza (Mesa AZ) to hear amazing music, Christmas and not, and eat great food! Dancing cats, sing-alongs, bubbles, and more. You can take your own desserts in, too! I want to know where you got that cute little manger? 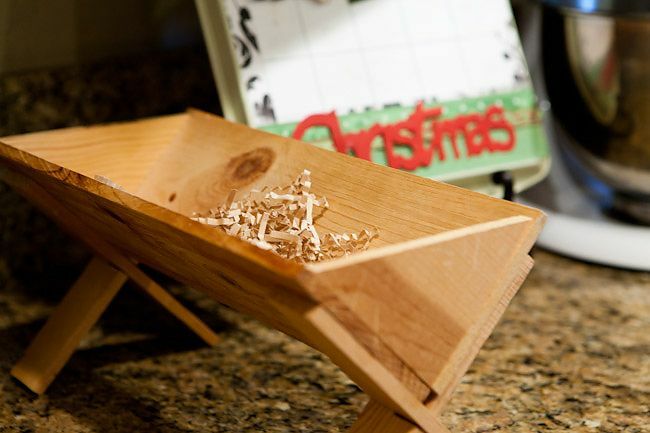 Love the straw in the manger idea! We have now done 2 years in a row- FHE on the symbols of Christmas from the blog "Chocolate on my cranium"- always a big hit. We also make a FHE out of going to the temple/visitor's center (L.A.) and see the beautiful lights and nativity. One of my favorite stories to read is, "A Christmas dress for Ellen" and "God Bless you way". Merry Christmas! We too love reading Christmas stories. This year we started a new tradition. Each day starting on dec. 12 (12 days of christmas) we have a bag with either a treat inside or an activity writtenon a slip of paper that we do as a family. It has been as simple as drive around and look at lights, we are making cookies tonite. we will go christmas caroling to neighbors next week. It's our own little Christmas countdown and gets us to do things together and slow down! We read three stories every year, along with others, but these three are a must: "Aaron's Christmas Tree," by Alma J. Yates, "The Other Wise Man," by Henry van Dyke, and "That Thine Alms May Be in Secret," by George Durrant. My kids aren't old enough for these stories yet, but my husband and I find time to read them together. Grab a box of tissues - all three will make you cry! We read a Christmas book each night too, but I wrap them in Christmas paper and place them in a basket next to my tree. We let the kids take turns picking one. They love to try to guess which books they are before they open them. I love the straw being paper....we've been using real straw and it gets so messy! And I also would love to know where that cute countdown calendar came from....it's darling! love gathering the nite before christmas tradition,..
straw in the manger... absolutely awesome. at our house, we eat by candelight in December. The kids love it. It makes it so special and we say our advent prayer. We also have holiday music playing in the background. it's so magical. Something we (my hubby and our four children) started a few years back - we gather around the tree and as we give each other a gift we tell that person something that we appreciate about them (a talent, a character trait or something they did). The spirit is so strong and it makes Christmas so much more special. The first time we did it we took over two hours just to disperse the presents. On Christmas morning, each child's main gift is hidden. They have to follow a string to find it. So, with 6 kids, the house is a big web of strings going every which way. We find them one at a time and it's fun to enjoy each person's reaction and joy as they discover their gift. I know, not very spiritual, but a tradition they look forward to and it helps us slow down. Oh, and we always have powdered sugar donuts on Christmas morning. We also do the straw in the manger to help us remember to serve one another. Thanks for your blog. It always brightens my day! I am making a post on Christmas traditions and would love to be able to add this to it if I could. You could then implement your idea and place some straw in your manger!